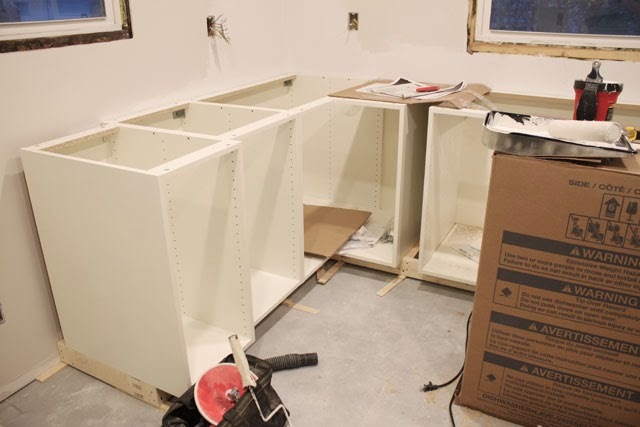 I've already shared that we started cabinet assembling. Mike built all the bases. He'll probably kill me for sharing this story, but I'm doing it anyways: He started on the corner base since it was a bigger box and it made sense to start there and build off of. So, as I was painting the dining room with primer, Mike says something like, "you know this is so demeaning building these because it is so below my skill level", all while half-assingly following the picture diagrams, (I've told you he's been reluctant about the Ikea cabinets), I laughed and he moved right a long and finished the first half of the base by nailing in the back panel with the finishing nails. Then he tries to attach the second piece. It's then he realizes that the top slat doesn't have the necessary holes needed. He wasn't paying attention and reversed the two and the one with the holes now had a million nails in it and was attached to the back panel. There were a lot of yelling and bad words, and then he was pissed that the directions should have pointed this out in some way. So, he looked back through and sure enough, there is literally a hand pointing this out. He ended up drilling his own holes and it was fine. 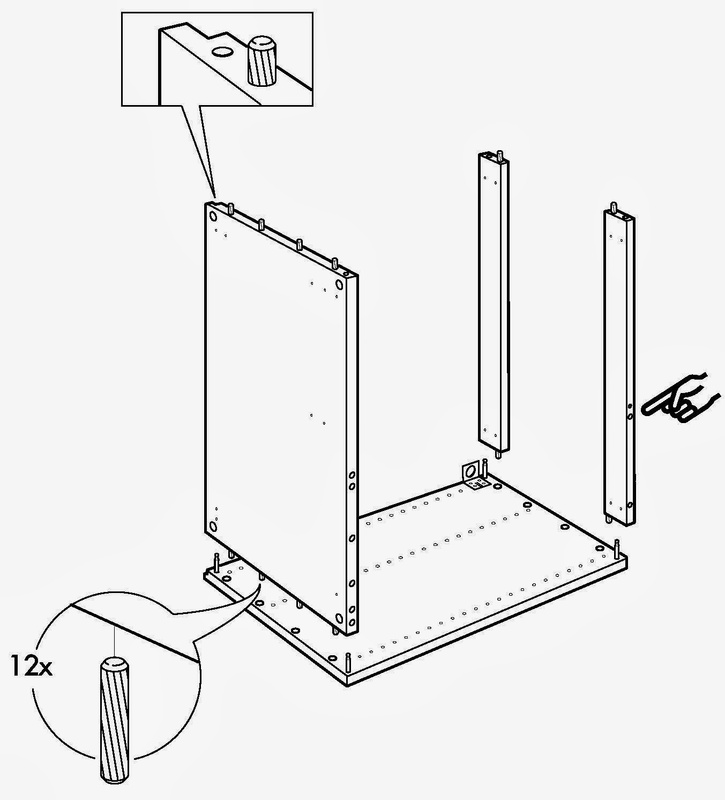 But, the moral of the story is: Ikea's products are different. 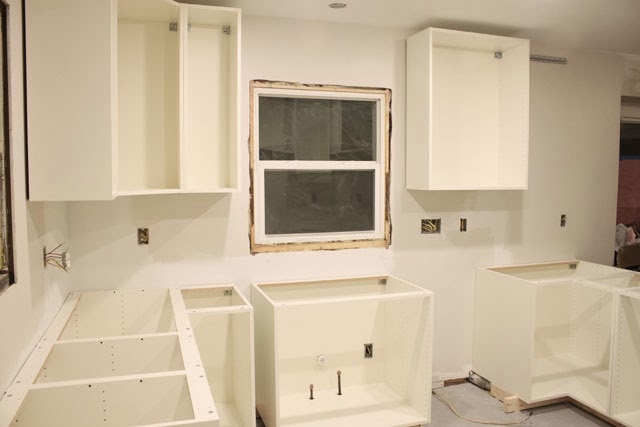 Mike's built cabinetry before so he assumed he knew how it would assemble. He was also a little pissed off at the moment and not happy with me for picking products that required so much assembly. We all have our moments! 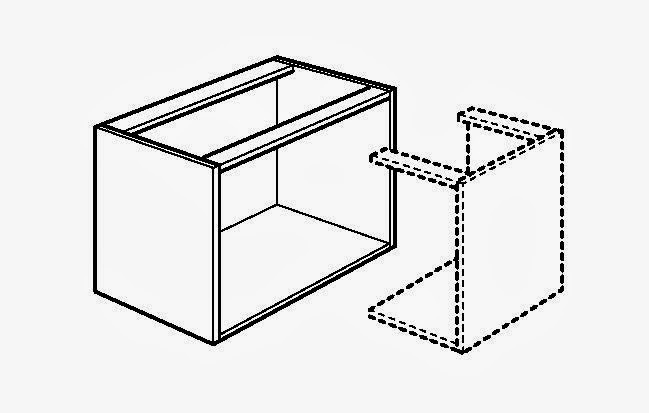 Since Ikea uses a lot of the same pieces for different products, it's important to note which holes are used or pieces. Mike's more skilled then most, so if he can mess up, anyone can! But, you better believe after the learning curve and one more cabinet, Mike was a pro and flew through the rest of the frames. 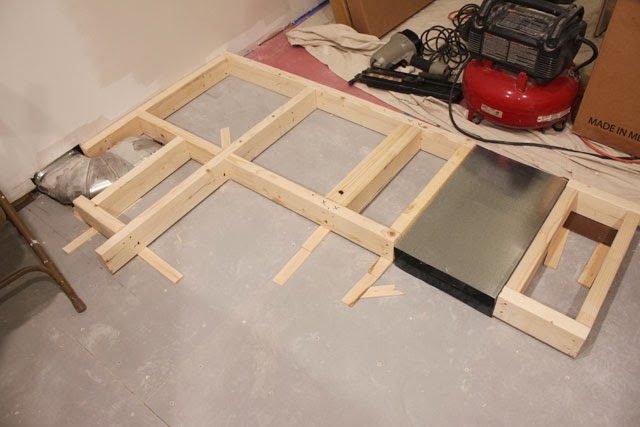 He built all the base frames first, because we decided to forgo the Ikea cabinet legs and build bases ourselves. 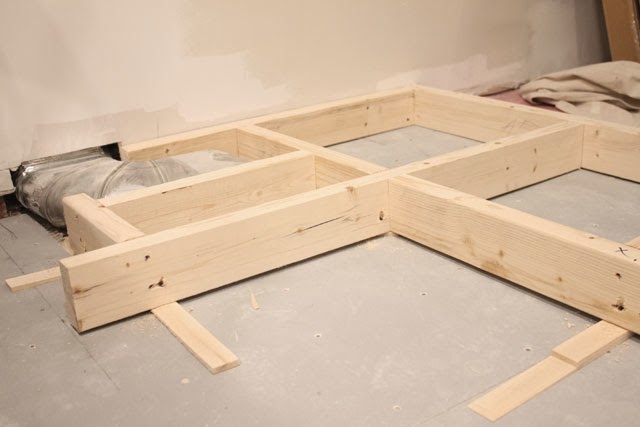 We laid out all the base frames and Mike built the bases using 2x4's and shims. Ikea toe kicks are 4" high and we had to take into account our tile as well. It was a pretty straight forward shot except the cabinets that make up the peninsula. 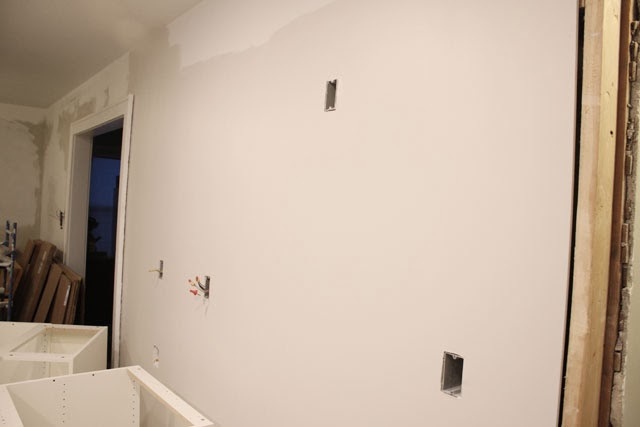 Since there used to be a wall here, we had some duct work to build around. 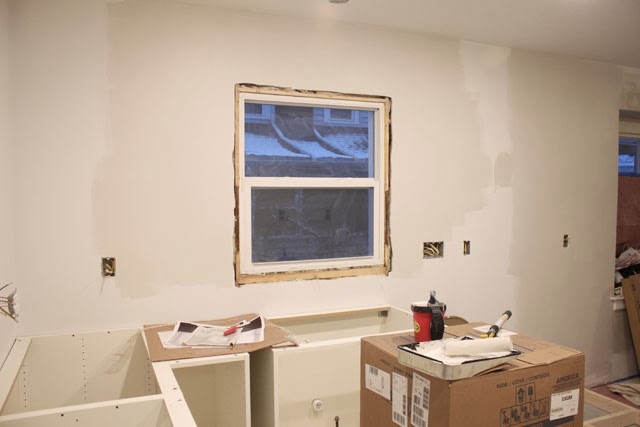 The hole in the floor, (that numerous people almost feel into, myself included), that used to have double sided vent to the kitchen and dining room was built up under the cabinet and now, one side vents out to the dining room and the other to the kitchen all under the peninsula. 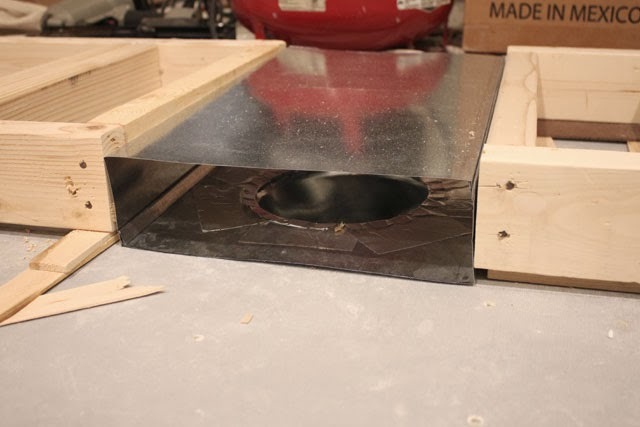 Mike added a square duct to the round and made sure it all laid flat under the new duct. It has no structural need since the frames on either side carry the load. The other vent that goes to the guest room was also configured into the base design. 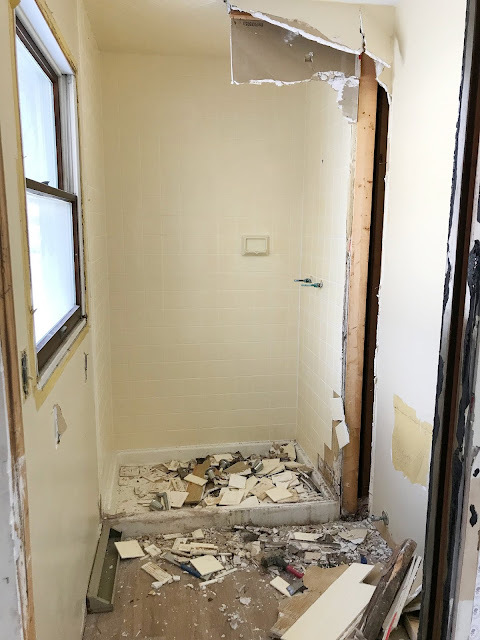 Mike used shims to level everything, which is a process in itself in a house this old. Once these were made, he attached everything straight into the tile backer. We chose to go this route in lieu of the plastic legs because, it sounds crazy, but for Mike it's easier for him to build his own bases. 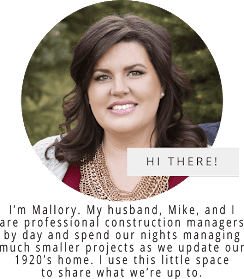 He has more control over the sizing and working with our uneven floors and obstacles. While Mike was building the bases I actually got in and started painting. The bases laid out allowed me to paint all the areas that would be exposed. Knowing that the corners would never be seen I only painted up to a certain point. 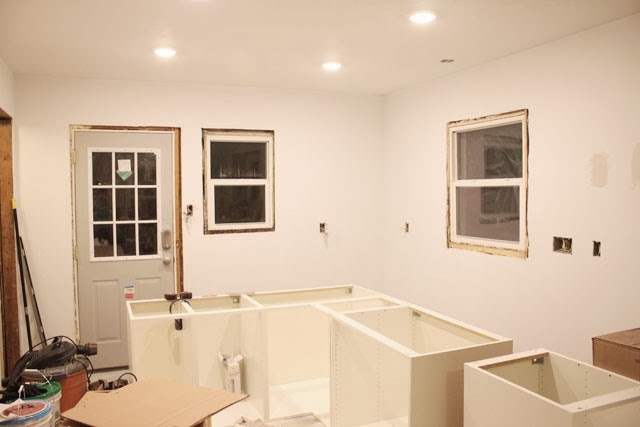 I always primer everything so that the drywall is sealed, but for finish coats, I'm not doing more work than necessary! I did end up getting the Sherwin Williams 'Pediment' mixed at 50%. I don't know if there's that much of a difference, but I feel like it's a tiny bit lighter than the original. Since it's all at night these pictures aren't the best representation, but it's a greige color that is more beige in artificial light, and gray in natural light. 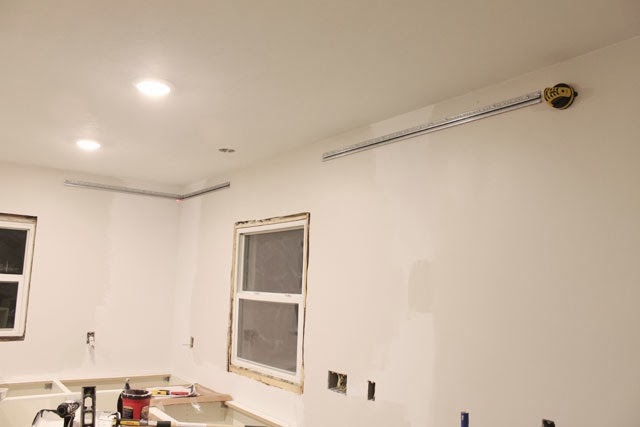 Once the walls were dry after 2 coats, we hung the rail systems using a laser level to maintain the same level line while turning the corners. 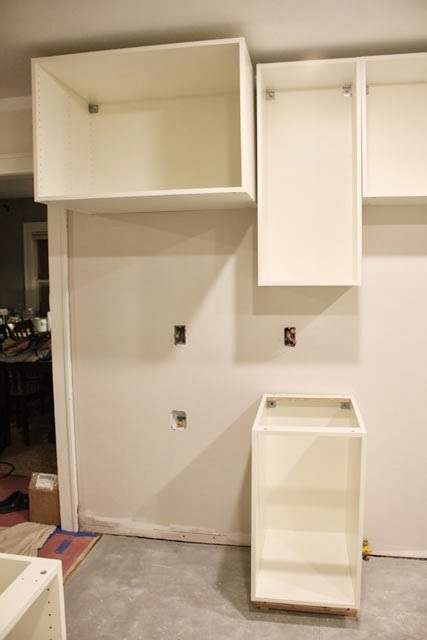 Mike thought he was really smart and added blocking where we would be hanging the rails and below where the base cabinets were attached to the wall. 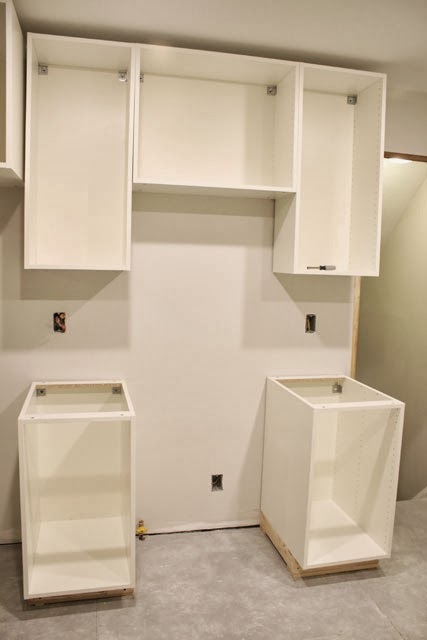 We decided to raise the cabinets a little bit once we had them built and saw where they sat and one wall of blocking worked perfectly, but the other was too low so he used a combo of drywall anchors and hitting the studs. 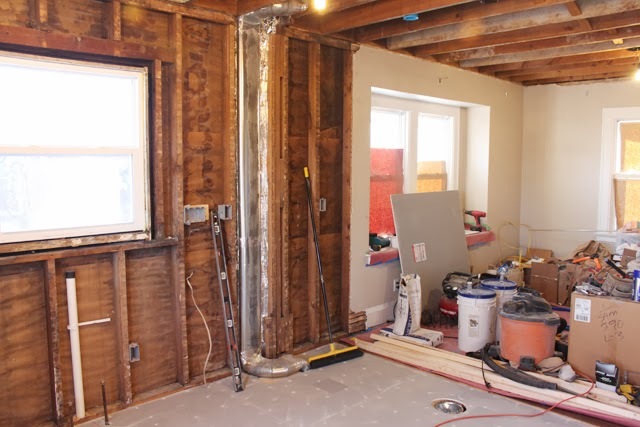 I took photos before the drywall went up so that we could also see where obstructions, like ducts, were so that we didn't screw into those. 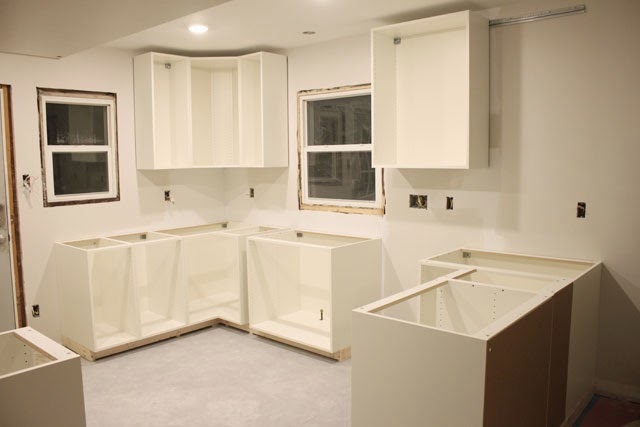 Once we were confident in the railings, we added the upper cabinet frames. We're missing one more upper cabinet on the right end because it got damaged during delivery. The other side is waiting for the microwave, oven range, and refrigerator. 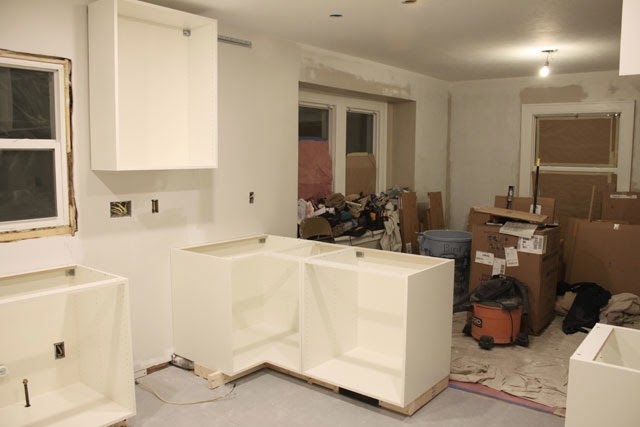 We have to install the tile first, then add the fridge panels before locking all these cabinets and bases in place. 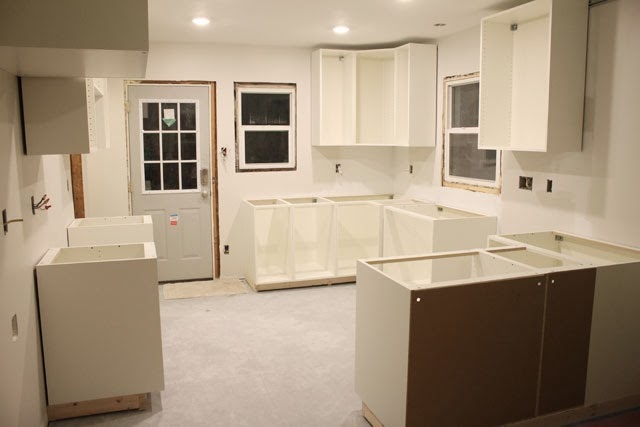 It's crazy how large the kitchen feels after putting in all the cabinets. Mike and I are really excited about the tall cabinets, they make the room feel crazy tall.